And Team GB came fourth. Unbelievable. 19 Gold medals. Count them. Isn't it remarkable how the achievement of others can make you feel great? I mean, we are not a great Olympic nation. In 1996 we had one solitary Gold Medal. In 1948, the last time London hosted the games, we had three. We have usually averaged about four or five. Use this fantastic page to see how we did (or how your country did, if you're not British) each Olympic year. The last couple of games have been a marked improvement. And suddenly this year has taken us all by storm. And success leaves us feeling - well, after one of the wettest summers on record, it has brought a bit of sunshine to us. And a bit of sporting judgementalism? The England football team continues to be, er, hit and miss. So they get it in the neck for not being as good as the cyclists. The track & field guys fail to finish the relay, and are critiqued for not being in the same league as the swimmers. One near miss said to an interviewer after not getting a medal, "I don't mind - I'm an Olympian!" - but he is in for a rude awakening when he gets home. We don't want Olympians. We want Gold Medal winning Olympians. Almost nothing. If you didn't see the "Memory Tower" in the closing ceremony, try & find it on YouTube. This is the kind of thing that Hollywood would have to do with CGI. And the Chinese did it with real people. Live. Completely amazing. Nearly as amazing as 19 golds for Team GB. Before you Americans that read this site do a mental thing whereby you note that inevitably you have more Olympic medals than Team GB, just pause right now. If Michael Phelps was British, we'd have 20 golds today. You guys have 19. That's how good an Olympics we're having. Australia is in a state of blind panic, because with five days of competition left, it's a pretty tight race, but we are in with a shout of coming above them in the medals table. As of this moment, we're third, and the Ozzies are fourth. There's no way that's the final placings, but it feels good! This is our best post-war showing. With some sailing, cycling and other very good opportunities still around, Beijing should become our best Olympic gold medal tally ever (well, except for London 1908, where we got 56 golds, many of which were for exclusively British events, including Tug O' War). Phenomenal. I can't believe I know so much about cycling! Or that I have been caught up in it all: I was honestly going to let the whole Olympic thing pass me by. I remember Munich. I got excited by Montreal. I was worried by the Moscow boycott. Los Angeles passed me by (do I remember pianos in the opening ceremony?) Seoul likewise. Barcelona was spectacular. Atlanta the commercial low point. Sydney superb. Athens a turning point for Team GB, but I'd lost interest. I was just ready for the new Premiership season. But now roll on 2012! Sport UK has set Team GB a target of fourth place in the medals table for 2012. We might just get close to that this time, thanks to Wiggins, Hoy, Addlington & co. People I knew almost nothing of a week ago, but now regard as national heroes. And yes, this is pure Nationalism. My country doing well. We get slightly nervous about that sort of thing usually, but it seems that in the shock of the splendour of the success, our inhibitions are fading, so without apology, I am enjoying every minute. You'll Never Know - final of the four songs we filmed back in May, with me singing and MGQ playing. This is beautifully paced "late night" jazz. A slow four, held back and teased to within an inch of its life. Glistening piano from Chris, lovely little bass work from Tom, some splendidly gentle brushwork from George, Dan at his subtle best on guitar, and (eventually) Stephen adds some beautifully mellow alto. You can feel the melancholy reaching out to bite you. This asks you to take time and wallow; "Forever" wanted you to dance for joy; this needs you to hold on to your partner for dear life and never let go. Or just see the bottom of your glass remains safely covered over with something golden. Ain't mood music grand? 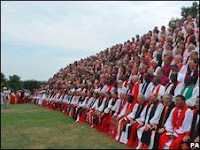 Anglican liturgy's finest hour. Lambeth was never like this, but then they forgot that boogie-woogie was how God meant us to praise Him. No wonder they had problems. This is me singing with MGQ back in May - thanks TL for the fine filming & editing - and again the whole band are having far too much fun. Poor Tom Airey had to take six of his fingers to Casualty after recording finished. Goerge Wilson fires us on with his relentless rhythms, Dan Jones supports on guitar, Stephen Roberts plays his usual fine alto, but the star of the show is "Three Hands" himself, Chris Gilligan. When I talk of finding The Law to be the best way of understanding The Cross, I mean it in the broad brushstrokes and in the detail. So, for example, the Ten Commandments can be read in all sorts of ways - but if the previous post has any merit, and if The Law is supposed to point us to the Saviour and to the cross, have you ever stopped and tried to see the Top Ten as something Jesus fulfils on Good Friday? 1. "No other gods before me". Not self. Not anger. Not power. Not the way things are. Not comfort. Not 'My Way'. All these things are put in their place by the Saviour on the cross. 2. No idols. Not Caesar - "the system". Any system - for the Jews it was the religious system that they wanted to preserve that stopped them seeing the God who had come to save. Again, not self. In many ways this is simply the first one repeated. But Jesus strips bare the idols of the world as he is put on a pole and lifted up. Note - the punishment for sin is given a limited shelf-life; the reward for righteousness is never-ending. Mercy shines out from the cross. 3. Blasphemy. All around the cross, God's name is abused and spattered with filth and mud. Jesus? With his own name being pelted with muck, he sings to God a Psalm of praise (Psalm 22) and cries "Father forgive!". 4. Sabbath. Two things. His work was done on day six; on the seventh he rested in the tomb, before beginning a new world of re-creation on the first day of a new week. But second - do note that this command makes everyone equal in the sight of God. This is no "rest for the rich", whilst the poor keep them comfortable. Everyone gets the same here. By God's command. Everyone is on a level playing field at the foot of the cross. 5. Honour your parents - that you may live long. Well, Jesus takes care of his mother's needs (with John) and praises his Father's name. But live long? Oh yes; eternally. 6. No murder. At the cross, the place of death? But Jesus uses it to bring life: if he comes down, it is indeed a place of death, but for us this becomes a gate to life eternal. Indeed no murder - just gift. 7. No adultery. Isreal commits one last act of prostitution, Hosea-like selling herself to Rome, Gomer's last fling. But Jesus takes on his people's mantle, their role, their calling, their unfulfilled faithfulness, and the faithful Son remains true to his first love. 8. No stealing. Satan steals hearts and minds. Jesus frees them. Satan tries to steal his life; but there is no theft here - this is freely given, and will be freely taken up again. To have kept what was rightly his, that would have been theft - the robbery of our eternity; but that was not on Jesus mind. He was keeping The Law. 9. No false testimony. Oh, it abounds from the religious men who bought it in order to bind Jesus to two planks of wood and keep him there till he bled to death. But Jesus is silent: no true testimony either from him in this place about those people - for his true words would be their condemnation, and the Son of Man came not to condemn the world but to save it. 10. No coveting. "When you come to your kingdom - remember me!" How he must have longed for that moment. But it was not a selfish longing. Glory is no glory when kept alone. It is to be shared, not stored. He gave it away. He gave everything away. Now, I'm not saying this is the only way to read the Ten Commandments. But I am saying that The Law always works like this: it points us to Jesus. So when we have problems with it, one of the first things we have to do is wrestle with it in this context: "what is this passage trying to tell us about Jesus?" And then we work from there. And by the way, I'm using the Deuteronomy 5 version, which goes on over the chapter line to have Moses sum it up in these words (Dt 6.5): "Love the Lord your God with all your heart and with all your soul and with all your strength." Not a bad summary, familiar from something Jesus once said. Amazingly, straight from The Law. My good friend Ricky is having a go at finding the place of the Old Covenant in Christian thinking over at his Doubting Thomas blog. Basically, he doesn't find much place for it - and I disagree. But I do think that an awful lot of Christians would start from a place of agreeing with a lot of what Ricky says. So I posted a (very) long comment on his site, and I offer here an edited version of it. The problem many people have when faced with the Old Covenant, is a misunderstanding of the concept of "The Law". There are 613 laws within "The Law" in the Pentateuch, and about two-thirds of them are about how we relate to God. The remaining third are about how we relate to each other. Strangely, we focus massively on that latter third, as if it's the stuff that really matters (well it's about us so of course it's more important - hmmm...) and that is symptomatic of the problem, but there's an even deeper issue at stake. In the beginning God created everything and it was glorious. But people sinned, and spoiled it all. So God pondered what he could do to restore poor fallen humanity - and came up with plan A - The Law. The only problem was - it didn't work; no-one was good enough to keep it. So then he came up with plan B - Jesus and the cross, and this time because it didn't depend on us being good (but sneakily on us being bad) it worked a treat. And all lived happily ever after. Am I right? Is this (albeit in simplistic form) something like how you think it all works? And now that we have the cross, grace, forgiveness, PLAN B, we can ignore the vastly inferior plan A? Respectfully, this is theological tosh. The cross is plan A from all eternity. Always. But here's the thing - without the Law and the Prophets, it cannot be understood. They are signpost and guidebook to the destination of salvation, teaching how to get there, and what it will look like when we see it. Without them, we are tourists on the Gare du Nord thinking we have seen Paris. The Old Covenant is given that we might have a world view that comprehends the New Covenant. 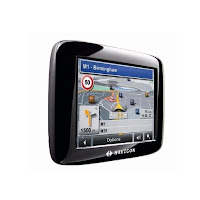 At the birth of the New Covenant, the Old becomes obsolete in the way that the SatNav (that's "GPS" for US readers!) in your car is obsolete when it says "you have reached your destination" at the end of a long and arduous trip. But it still shows you the journey from death to life, the key route points along the way, and crucially major things to see now that you have reached "Life". Would you agree that the Christian life is to be a life marked out by regular acts of worship in which we encounter God, and that our lives in between these acts are to bear the marks of having met with God and having been transformed by him into his likeness? Hey presto, you've just agreed that Leviticus is relevant for Christians today. And I agree with you. Now - beyond that, there are fascinating conversations to be had. Not because The Law can be wiped away, but understanding The Law not as a moral code to inflict misery on humanity, but rather as a map of salvation to point us to Jesus, that map needs to be studied and understood. It has gold for the treasure seeker. Ricky in his blog brings up the whole issue of the principal of "Sabbath for man" and this is a crucial issue for us as Christians, because the whole Law works that way: God working to make people's lives better. Eternally better, for sure, though I wish we weren't so hung up about that - the OT really doesn't make a secular/spiritual distinction, it just seeks to make life better, presuming that this means everything. And if Jesus catches The Law being used to make people LESS, he gets angry. Women with a menstrual flow who are forbidden to touch him - but then, his touch heals; so she had no flow by the time her finger left his robe. Philip Yancey has a great phrase: "Jesus, the sinless friend of sinners". We in the church have made the Old Covenant so obsolete we haven't the foggiest idea what it's for anymore. So some ignore it (and become friends of sinners, but sinless? Nonsense - they are indistinguishable from the people they befriend) and some think they keep it (trying to be sinless, they point at people who they consider to be "less", and so are no-one's friends) and The Law is broken to a thousand pieces and stamped upon and ground into the soil in a torrent of abuse and an ungodly fight for power in the church. If only we had kept sight of the best signpost and guidebook to the destination of salvation God in his wisdom saw fit to grant us, and to learn its wisdom and its lessons. We might have a little more understanding in our contemporary debates. For sure, the Law without the Cross can be bitter, but the Cross without the Law is weak - both ways we are incomplete. And there's really no need. and a SatNav for my path. I confess, I may have changed a word in there. St Paul himself argues that: "The law is holy, and the commandment is holy, righteous and good." (Romans 7:12) for this reason. It's not enough - but it was never meant to be (which is kind of the argument of Hebrews - taking all sorts of details of the Law it shows how they point to Jesus and says along the way that these details were always and ever supposed to have this role: "The Law is only a shadow of the good things that are coming", Heb 10.1) for that is the role of Jesus. But if you try to get Jesus without understanding the Law, it's like trying to make pancakes without flour. Or me driving from Pontypridd to Warwick in two hours without using SatNav. So I'm with the Psalmist. I love anything that points me to Jesus. And if people want to use this stuff to make life harder - I think Jesus would be quite stern about that, because that's not what it's for. Truth is truth: and truth here is purpose. The Law exists to point us to Jesus. That was its raison d'etre from day 1 (Heb 11.39-40, anyone?) and remains so now. I'll drink to that. Deep, and long, and often. Last year at Furnace, I felt like I was auditioning for the part all the time. I discovered that I liked doing the work – helping young adults connect with God, and seeing Him bless their socks off – and hoped I would be allowed to do it again. This year, I’m over that “audition” panic. I have the job, and actually, I love it and think that passion and vision and gifting a small amount of ability will get you a long way. That and an amazing team of wonderful people. Here you have them – seated (l to r): Diana, Anita, me, Ed, Matt; and standing (l to r): Elen, Kirsty, Mike (from Superhero), Matthew, Tim, Mark, Abi, t’other Mike (from Superhero), Gary, Tim (from Superhero – holding a couple of John’s dreadlocks from Superhero), Martin & Ben. Highlights? Praying for a guy whose knee has been crook for a year. He had surgery after messing it up doing Thai boxing. He can’t kneel without great pain. As we pray for him, I place my hands round his knee, and feel it flutter in a way a knee shouldn’t do. After a couple of minutes it sort of pops into my hands. I ask how he feels. He says, he can feel it grinding. He wants to try kneeling. There’s no pain. None. Two days later – still no pain. I make him pray for my bogus knee, and for a while I too am pain free, though it hasn’t stayed as good as it was for a while. But it is better than it was. Doesn’t matter – feeling that healing was astounding. Astounding. Seeing one guy start the week really low and go through a wonderful turn around. Not all sorted, but all turned round and able to get on with living with God. Seeing another choose to try again with God when he’d really walked away for a whole year. Watching people grow in expectancy that God loved them and would meet with them. Seeing a few people want God to touch them on the first night; but two thirds of the room went down on their knees on the last night when invited to let Him in. The Furnace – it’s a blast. I’ve just had a text from a team member saying that they were “blown away” by being part of it (I used those words all the time, because they were true), and then they added – for real, not just to use those words! When you do a seminar on prophecy and then get people listening to God and speaking over each other, hearing Him speak like this for the first time & discovering that what they are daring to say is stunningly accurate to the person listening, it’s hard not to be. It’s hard not to be blown away by the wonderful love of God who wants all these young adults to know Him more, every day. Lord, may it be. And thank you for giving me a place in their stories. It has been a joy and a privilege. Wonderful, Matt Collins playing one of his own (brilliant) songs at Tuesday night's cafe, with Jess Wilson and Bruce Collins (Matt's Dad & incidentally chairman of New Wine Cymru) watching on. I've just read one of Andy Booth's blogs about this event, and he is remarking that it is great to meet up with old friends - and to make new. So it is. My team here is amazing - all of them. All of them. And across the conference I am meeting wonderful people - even at the B&B where I am staying. Hey - I need to pay tribute to Andy. he will be speaking at our Cafe tonight, and if he is coming to this event next year, I want him to be one of our main evening speakers. He is an amazing humble man of God. He leads a church where they have the number of people attending every week that this conference sees in its adult venue, but he quietly allows people to pigeon-hole him as the worship leader, though his experience in speaking, teaching and leading ministry prayer is enormous. I do not have his humility. If I were him, I would find the way he seems not to be consulted on issues on which he is truly qualified almost unbearable. He just fulfills his role here and blesses people. A man of God. Awesome. Amazing prayer, wonderful worship, great teaching. The Furnace continues to fire! This is a great week, with very long hours, and very good friendships, and very good times with God and with his people. The cafe is a joy. Being able to sit with great men of God and speak to them of their lives and calling and hear how they work is a total privilege. David Parker was awesomely inspiring, but then Dai Hankey and Kenny Borthwick were also remarkable, and last night with Nigel James was both fun and inspiring all at the same time. David came back to speak at one of our eveing meetings, and was simple and direct, calling us to dig deep wells into the Scriptures so that God's living water could flow deeply in our lives. The ministry afterwards was wonderful. Many folk were gloriously touched by the Spirit. And the weekend band have been supplanted by Superhero, who have joined up with Matt Collins. This is them all pretending to be keyboard players. They are phenomenal. There is a world of difference between a collection of good musuicians and a BAND. A group who play as a unit, a seemless flowing machine. And Matt's worship leading is a joy - a thing of beauty and simplicity. The team is great. Great. I love them to bits. All of them. And now - I fancy an afternoon nap. More snaps to come! I here am at New Wine Cymru, running The Furnace, the young adults stream of the Welsh New Wine conference. New Wine is a charismatic gathering, originally Anglican with strong Vineyard links for those of you for whom that means a lot, and we spend the best part of a week worshipping, teaching the Bible, experiencing God and trying to encourage folk in their faith. Last year was the first time The Furnace existed - check back for details - and now we are here again. 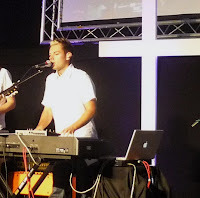 Matt Collins is leading worship in our main venue, and last night we had just shy of seventy people there - which was about a third up on the first night last year. Later on we had a cafe, with a chat show where David Parker was our main guest, and Tim Bannister sang three songs. David is a Vineyard pastor & an astoundingly inspiring man. Wonderful. We have had a great time: the sense of the presence of God is tangible. There is a real peace in our venue, and I pray this will grow through the week. Nigel James, our first speaker, quoted Max Lucado, who said that given 5 minutes with young people he would tell them to "Let God love them". David Parker added, "Don't let fear stop you - don't be afraid!" The team is fantastic - Kirsty and Esther and Mark from St Catherine's, plus Ben, Ed, Matthew, Jess and Elen (who arrives tomorrow). Tim & his tech guys are amazing. Diana and Anita complete the squad with prayer ministry responsibility and cafe duties. Today The Times published an article by Archbishop Henry Orombi entitled The Church Cannot Heal This Crisis Of Betrayal. I was saddened by it. By the "I love Anglicanism so much I must stay away" line. I get the purity stuff, but I also think there is perspective. You know my feelings about the relative merits of concepts such as love, grace, kindness, forgiveness, participation in the body etc over and above the current row on human sexuality, which (whilst having its place in the debates of the church) cannot compare with certain basic Gospel commands. So I dashed off a letter to the Times. Here it is - well, the second one down. I agree with Dr Butler, and Barbara Self and Ron Wood also I think make excellent points for the debate in general rather than simply at Archbishop Orombi, though his article rather lays him open to this charge. Richard Haggis' first paragraph also needed saying, though I am not sure I can go with his whole letter. Others are coming from places I am not, but when we speak, this is what happens. I was very glad I added my line about prayer: I think Henry has a hard time of it, and knowing the bad choices I regularly make in my small corner, I can only thank God that I do indeed make them in my small corner. I did not mean to be rude to an Archbishop, but to plead for some perspective, and for the greatest of Biblical truths in all our doings.